ww2dbasePrince Narukata was born in Tokyo, Japan in 1875 to Prince Sandanaru of the Fushimi branch of the Japanese imperial family and Princess Toshiko of the Arisugawa branch. He was a second cousin to Prince Hirohito, who would later rise to the throne as Emperor Showa. In 1883, his name was changed to Hiroyasu and headed the head of the Kacho branch of the Japanese Imperial Family. In 1889, he dropped out of the Japanese Navy Academy and moved to Germany, where he would continue his naval studies and graduated from the German Navy Academy in 1895. In 1896, he married Princess Tsuneko Tokugawa, the ninth daughter of Prince Shogun Yoshinobu Tokugawa, the last shogun of Japan; he would have six children with her. During the Russo-Japanese War of 1904 to 1905, at the rank of lieutenant commander, he sustained wounds aboard battleship Mikasa during the Battle of the Yellow Sea. He was awarded the Order of the Golden Kite 4th Class for his services in the Russo-Japanese War. Between 1907 and 1910, he studied in the United Kingdom. In the early 1910s, he commanded cruiser Takachiho, cruiser Asahi, and battlecruiser Ibuki. In 1920, he was made a member of the Supreme War Council. In 1922, he was promoted to the rank of admiral. In 1923, he became the 23rd head of the Fushimi branch of the Japanese Imperial Family. In 1924, he became the commanding officer of the Sasebo Naval District. In 1932, he was promoted to the rank of fleet admiral. In 1934, he was awarded the Collar of the Supreme Order of the Chrysanthemum. Although in 1940 he expressed concerns over Japan's alliance with Germany, he nevertheless enthusiastically supported the plans to take French Indochina from France in order to support the war against China. In 1942, he was awarded the Order of the Golden Kite 1st Class. He continued to provide direction for the war through the end of the war, including showing support for the use of suicidal special attacks by all branches of the Japanese military, particularly after the fall of Saipan in the Mariana Islands, in order to regain the offensive momentum. After the war, as a member of the Japanese Imperial Family, he was not summoned to the trials in Tokyo, Japan. He passed away in Aug 1946. 16 Oct 1875 Prince Narukata was born in Tokyo, Japan. 23 Apr 1883 Prince Narukata was made the head of the Kacho branch of the Japanese imperial family. 11 Jun 1883 Prince Narukata was renamed Prince Hiroyasu. 5 Apr 1886 Prince Hiroyasu enrolled in the Japanese Navy Academy. 17 Sep 1889 Prince Hiroyasu quit the Japanese Navy Academy. 28 Sep 1889 Prince Hiroyasu arrived in Germany. 8 Apr 1892 Prince Hiroyasu enrolled in the German Navy Academy. 30 Mar 1893 Prince Hiroyasu graduated from the German Navy Academy. 20 Apr 1894 Prince Hiroyasu promoted to the rank of ensign. 3 Oct 1894 Prince Hiroyasu enrolled in the German Navy War College. 15 Aug 1895 Prince Hiroyasu graduated from the German Navy War College. 28 Oct 1895 Prince Hiroyasu arrived in Japan. 29 Oct 1895 Prince Hiroyasu was assigned to cruiser Okinoshima. 9 Jan 1896 Prince Hiroyasu married Princess Tsuneko Tokugawa, ninth daughter of Prince Shogun Yoshinobu Tokugawa. 20 Apr 1896 Prince Hiroyasu was assigned to cruiser Matsushima. 17 Mar 1897 Prince Hiroyasu enrolled in the naval gunnery school. 19 Jul 1897 Prince Hiroyasu was assigned to the mine force in Kure, Japan. 14 Sep 1897 Prince Hiroyasu was made an officer in the mine force in Kure, Japan. 1 Dec 1897 Prince Hiroyasu was promoted to the rank of lieutenant (jg) and was assigned to battleship Fuji. 8 Dec 1897 Prince Hiroyasu's first child, Prince Hiroyoshi, was born in Tokyo, Japan. 27 Dec 1897 Prince Hiroyasu was promoted to the rank of lieutenant. 14 Nov 1898 Prince Hiroyasu's second child, Princess Yasuko, was born. 26 Aug 1899 Prince Hiroyasu was assigned to armored cruiser Asama. 13 Oct 1900 Prince Hiroyasu was made a gunnery instructor. 10 Jun 1901 Prince Hiroyasu was assigned to armored cruiser Izumo. 26 Jan 1902 Prince Hiroyasu's third child, Prince Hirotada, was born. 22 Apr 1902 Prince Hiroyasu was assigned to battleship Asahi. 24 Jul 1903 Prince Hiroyasu was assigned to battleship Mikasa. 29 Jul 1903 Prince Hiroyasu was promoted to the rank of lieutenant commander. 16 Jan 1904 Prince Hiroyasu returned to the Fushimi branch of the Japanese Imperial Family. 5 Oct 1904 Prince Hiroyasu was attached to the Navy Department in Tokyo, Japan. 22 May 1905 Prince Hiroyasu's fourth child, Prince Hironobu, was born. 20 Aug 1905 Prince Hiroyasu was assigned to the armored cruiser Niitaka. 3 Nov 1905 Prince Hiroyasu was awarded the Grand Cordon of the Supreme Order of the Chrysanthemum. 1 Apr 1906 Prince Hiroyasu was awarded the Golden Kite 4th Class and was made the executive officer of coastal defense ship Okinoshima. 11 May 1906 Prince Hiroyasu was made the executive officer of armored cruiser Naniwa. 28 Sep 1906 Prince Hiroyasu was promoted to the rank of commander. 5 Nov 1906 Prince Hiroyasu was made the executive officer of armored cruiser Nisshin. 15 Feb 1907 Prince Hiroyasu attended Japanese Navy War College. 18 May 1907 Prince Hiroyasu's fifth child, Princess Atsuko, was born. 18 Dec 1907 Prince Hiroyasu was assigned to the United Kingdom. 23 May 1910 Prince Hiroyasu arrived in Japan. 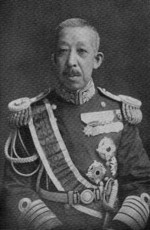 25 Jul 1910 Prince Hiroyasu was assigned to the Naval General Staff. 26 Sep 1910 Prince Hiroyasu was made the commanding officer of armored cruiser Takachiho. 1 Dec 1910 Prince Hiroyasu was promoted to the rank of captain and was made the commanding officer of armored cruiser Asahi. 1 Mar 1912 Prince Hiroyasu was made the commanding officer of cruiser Ibuki. 4 Oct 1912 Prince Hiroyasu's sixth child, Princess Tomoko, was born. 1 Dec 1912 Prince Hiroyasu attended Japanese Navy War College. 31 Aug 1913 Prince Hiroyasu was promoted to the rank of rear admiral and was named the commanding officer of the Yokosuka Military District. 18 Aug 1914 Prince Hiroyasu was named the commandant of the Japanese Navy Academy. 29 Aug 1914 Prince Hiroyasu was assigned to the Japanese Naval General Staff. 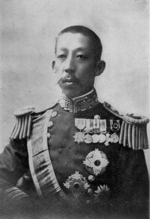 13 Dec 1915 Prince Hiroyasu was named the commanding officer of the 2nd Squadron. 1 Dec 1916 Prince Hiroyasu was promoted to the rank of vice admiral. 29 May 1918 Prince Hiroyasu's second child, Princess Yasuko, married Marquis Nagatake Asano. 16 Jan 1919 Prince Hiroyasu's second child, Princess Yasuko, passed away. 1 Dec 1919 Prince Hiroyasu was named the commanding officer of the 2nd Fleet. 23 Dec 1919 Prince Hiroyasu's first child, Prince Hiroyoshi, married Prince Tokiko Ichijo. 1 Dec 1920 Prince Hiroyasu was named a member to the Supreme War Council. 1 Dec 1922 Prince Hiroyasu was promoted to the rank of admiral. 4 Feb 1923 Prince Hiroyasu's father, Prince Sandanaru, passed away. 27 Oct 1923 Prince Hiroyasu was named the protocol officer of the Imperial court. 5 Feb 1924 Prince Hiroyasu was named the commanding officer of the Yokosuka Military District. 24 Mar 1924 Prince Hiroyasu's third child, Prince Hirotada, passed away. 26 Jan 1925 Prince Hiroyasu's sixth child, Princess Tomoko, married Prince Asaakira Kuni. 15 Apr 1925 Prince Hiroyasu was named a member to the Supreme War Council. 27 Oct 1926 Prince Hiroyasu's fifth child, Princess Atsuko, married Count Yukiyasu Kiyosu. 2 Feb 1932 Prince Hiroyasu was assigned to the Japanese Navy General Staff. 27 May 1932 Prince Hiroyasu of Fushimi was promoted to the rank of fleet admiral. 1 Oct 1933 Prince Hiroyasu was made the chief of the Japanese Naval General Staff. 29 Apr 1934 Prince Hiroyasu was awarde Collar of the Supreme Order of the Chrysanthemum. 24 Feb 1936 Prince Hiroyasu's fifth child, Princess Atsuko, passed away. 19 Oct 1938 Prince Hiroyasu's first child, Prince Hiroyoshi, passed away. 18 Aug 1939 Prince Hiroyasu's wife Tsuneko Tokugawa passed away. 19 Sep 1940 During the Imperial Conference, Prince Hiroyasu of Fushimi expressed concerns regarding the alliance between Japan and Germany. 9 Apr 1941 Prince Hiroyasu stepped down as the chief of the Japanese Navy General Staff. 4 Apr 1942 Prince Hiroyasu was awarded the Order of the Golden Kite 1st Class. 25 Jun 1944 At the Imperial Conference in Tokyo, Japan, Prince Hiroyasu advocated the use of special attacks by all branches of the military. 30 Nov 1945 Prince Hiroyasu's position with the Japanese Navy was abolished. 16 Aug 1946 Prince Hiroyasu of Fushimi away in Tokyo, Japan.